Okay, not liking sushi was pretty weak – lots of people don’t like sushi. If you’re looking to be shocked and appalled, try this on for size! .. I can’t use chopsticks. Seriously. At a table full of the whitest white people in the world, I’ll be the only person reaching for a fork. If a fork isn’t available (I’m generally too embarrassed to have to ask for one), I’ll either eat with my hands (I am a classy dame) or use one chopstick as a spear and stab my food for eating. This has the additional perk of turning all foods into Food on a Stick; making everything taste better – but it doesn’t work for eating rice. In fact, I don’t understand how people eat rice with chopsticks AT ALL, yet the vast majority of the world seems to get by just fine. My inability to use chopsticks goes way, way back to my formative years. I used to get in trouble a lot at school because 1) my teacher was a horrible woman and 2) I didn’t hold my pens properly. She would call up my mother and tell her I was having all sorts of problems in school, and my mom would react in a typical way – by forcing me to spend hours and hours writing out the text from my books until my hands cramped, all under her watchful eye and constant threats of beatings with a rattan switch. Helpful! While my writing did eventually improve, the way I held my pens never did – in fact, the main reason I was having “trouble” to begin with was because I was forced to hold things “properly”, instead of what felt right in my tiny tiny hands. I don’t hold pens or cutlery properly in my hands. This isn’t a big deal – I can (mostly) eat and write without covering myself in food – but everything falls apart when it comes to chopsticks. The finger meant to open and close the stick on your food is the digit I use to anchor things in my hand, and it just .. doesn’t work. I end up eating my food three grains of rice at a time, and it’s time consuming and enraging when I’m very hungry. So, I use a fork and bask in my shame in a city where more than 50% of the population is some sort of chopstick-using Asian. I am embarrassed for myself on a regular basis, and Ed delights in pointing out the fact that his Asian wife can’t use chopsticks while he can and does. 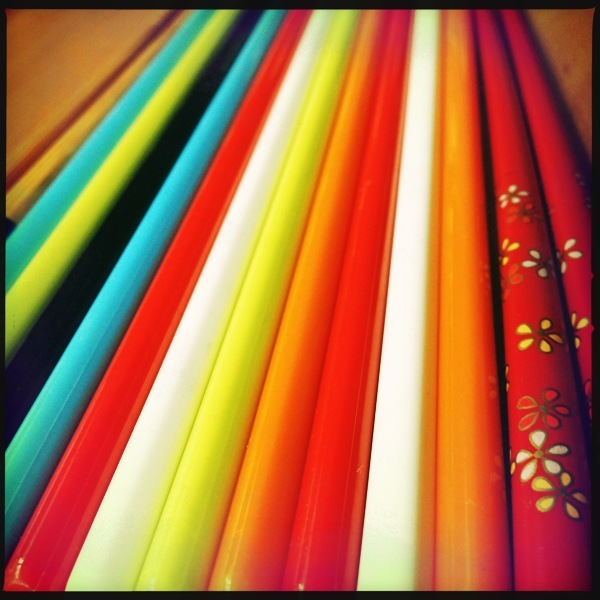 Of course, even though I am the worst I am still Asian – I own around two dozen pairs of chopsticks in fanciful designs. Some are even made for beginners, with notches on them to help with food grabbing. Doesn’t matter – can’t use them. I’ll turn in my Asian card now.